Gooburrum Shire, an area of 1304 sq km, was immediately north of the Burnett River at Bundaberg. Its Pacific Ocean border ran northwards to Baffle Creek, and its inland border ran generally southwards through the Wantulgan Range to Bullyard, near the Burnett. Its largest urban area was Moore Park on the coast, although North Bundaberg was in the shire until 1918. The origin of the name is uncertain, but a connection to an Aboriginal expression concerning ibises has been suggested. Much of the Shire's area was occupied by the Kolan (Colanne) pastoral run, c1855. Local government was established with the Kolan Division, from which Gooburrum Division was severed in 1886. The Shire consisted of coastal lowlands crossed by numerous watercourses (including the Kolan River), ascending to foothills and broken ranges. Beef cattle (15,700 head in 1993) are grazed inland. Closer-settlement began in the 1860s, and the clearing of that Gooburrum 'scrub' yielded fertile soils that sustained two maize crops a year. Plant disease and falling prices caused a change to sugar planting, which gathered strength in the 1870s. 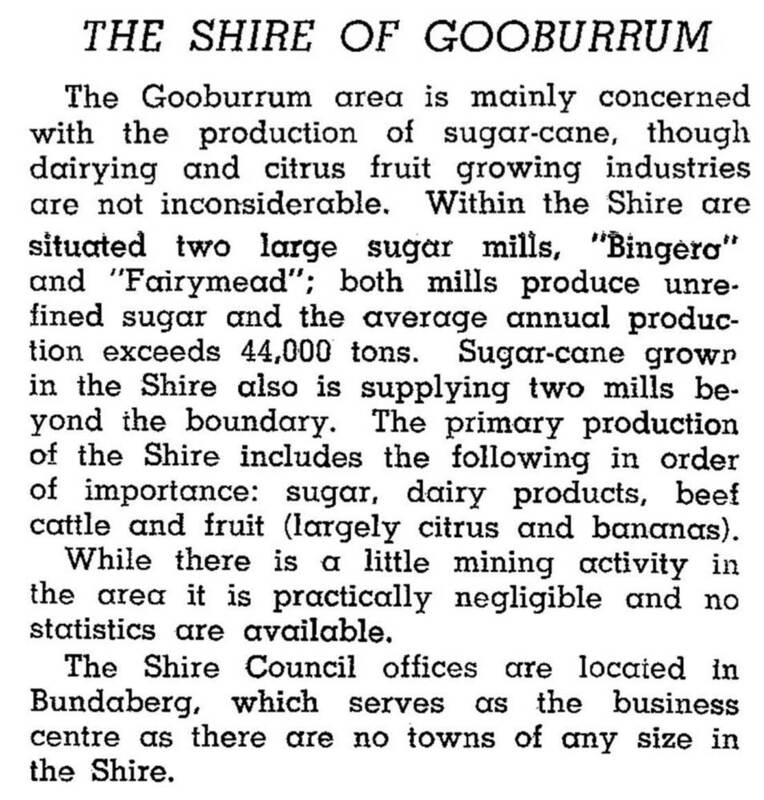 Two large sugar mills emerged in the early 1880s: Fairymead, 8 km north of Bundaberg and Bingera, 18 km south-west of Bundaberg. They comprise two of the three large factories of Bundaberg Sugar Ltd. Bingera has prospered from irrigation water drawn from the Burnett, where a weir was built in 1933 to hold back tidal water, and Fairymead found reliable groundwater wells.